Friends and neighbors alike will be impressed with this visually stunning raised Fire Pit! The "Carter" Outdoor Fire Pit by Leisure Select offers custom stone and tile picked by the most important person: you! And this easy-to-operate propane fire pit offers accent lighting, giving you a beautiful centerpiece on your porch or patio. 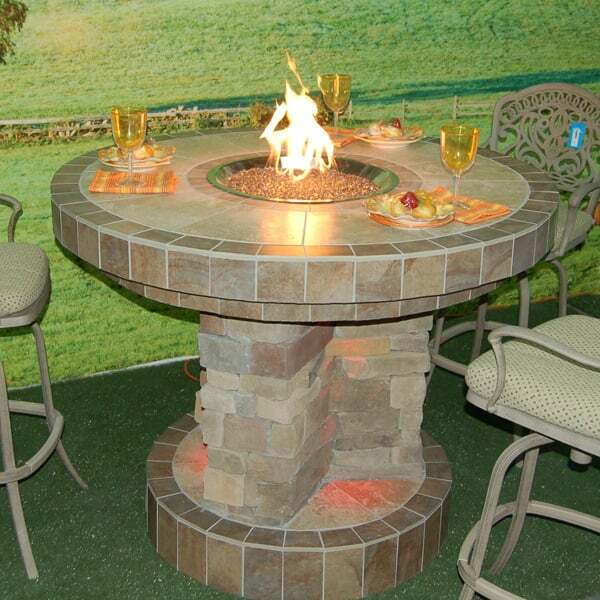 Why not add a fire pit to your Outdoor Room? With many colors and choices of tile and stones, we promise you can build a fire pit to match your home's decor and style. Nothing warms up an outdoor party like a fire pit! So warm up your guests and visitors with the "Carter" Outdoor Fire Pit Project by Leisure Select! Leisure Select offers a full line of outdoor fire pits that are custom made to your specifications, including size, color and type. There are a variety of options to consider when building an outdoor fire pit and we specialize in helping you with the design. If you already have plans, or an idea of the look that you are trying to achieve, we can build it exactly to your specs. The quality of materials and craftsmanship that goes into every stone or stucco fire pit is what separates our products from other similar looking designs. Each piece of cultured stone is hand selected based upon size and color and is placed accordingly during construction. When stucco is used, only the top grade Parex 100% acrylic finishes and coatings are used ensuring a tough UV resistant skin that is pliable, vapor impermeable and wear resistant. The internal frame is constructed using aluminum studs that are extremely durable and rust proof.